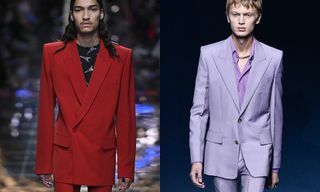 There’s talk of a return to tailoring at fashion week. 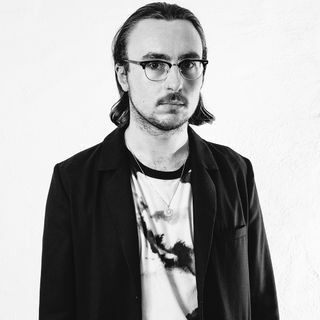 Back in June, when Raf Simons showed his SS19 runway show, he proclaimed the end of graphic hoodies, explaining to press backstage that he was in search of “a new outline.” Then, this Friday, Hedi Slimane broke the internet when he debuted menswear for Celine, reworking the house’s image with the same sexed-up, tailored blueprint he established at Dior Homme and Saint Laurent. 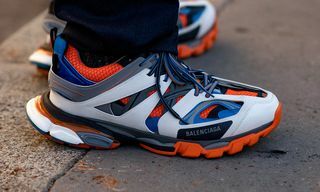 It’s inevitable that after a few years of luxe-streetwear madness, the pendulum would swing the other way and designers would start exploring more formal ways of dressing. If anyone’s going to show us a reason to dress up, though, it’s Haider Ackermann. 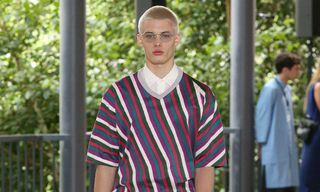 While the world was going streetwear crazy, Haider was refining his own vision of rogueish, swashbuckling clothing, and the designer’s unisex show in Paris offered as convincing an argument as any that fashion should start dressing up again. 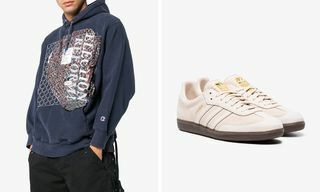 In the days of relaxed dress codes and luxury hoodies, the suit is more like a secret weapon than an everyday essential, and Haider’s tailoring, with its loose cut and cropped, roomy legs, are both casual and flashy enough for modern tastes. 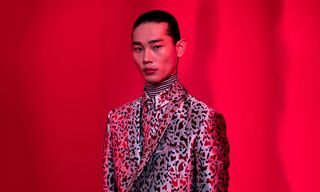 His intricately laser-cut shirts, silk pyjamas and sunburst jacquards are there for when the occasion calls for a sartorial earthquake. 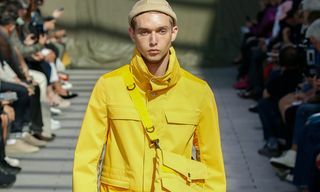 There’s constant reshuffling at fashion week these days — instead of showing men’s back in June, Ackermann decided to put both genders on one runway, highlighting how blurry the lines are between men’s and women’s wardrobes in this day and age. Regardless of what’s happening in the rest of Fashion Land, though, Haider Ackermann’s collections are a joy to behold. For more from Paris Fashion Week, check out Hedi Slimane’s controversial debut collection for Celine.